Where are all the public plazas in Winnipeg? Montreal has lots of great public spaces – right downtown. This example is large enough to host a massive art show called Balançoires (Swings) which consists of 8 constructed swing sets with 3 swings each. They are lighted, and each swing plays a musical note from one of four instrument types. The whole plaza is filled with activity, music, lights (at night) and smiles. Lots of babies, kids, dogs, students, singles, couples, professionals, elderly – everyone, every type of person was there relaxing and having fun. Let’s close Portage Avenue to vehicles from Main St. to Memorial from May 15– Sept. 15. Want to promote visible (on the street) movement in and around downtown? Or maybe you work on Broadway but want to check out a new café in the Exchange at lunch hour? Rent a bike for 90 minutes to get you there and back! Check these out…they are located all over downtown Montreal. I’m sure there’s a map somewhere on-line of where these fantastic pay by time bike rental kiosks are located, but I’m too lazy to look it up now. At any rate, they were busy. Lots of people taking out bikes, putting them back, riding around, going here and there. I’m not going to mention bike lanes. I’m just not. I’m sick to death of that backwards discussion here in Winnipeg. Suffice to say, in order to rent bikes to the public, there should be safe places for them to ride. 4) Waste and Recycling receptacles. Yes, we have them – cudos downtown biz – but could they be cleaner and better looking? Hell, yes! These beautiful waste and recycling receptacles are everywhere in downtown Montreal. I know Montreal has a less than stellar reputation for, shall we say, bending the rules on codes and safety standards in ‘certain’ (lucrative) circumstances…and I’m not condoning that behaviour, but there comes a point when there are just far too many rules for anyone to have any fun at all. Just look at these temporary patios, constructed for a street festival on rue St. Denis. I’m going to assume that we aren’t allowed to build these in Winnipeg, because I’ve never seen them, not on Osborne or anywhere. But is anyone going to die because authorities turned a blind eye to the combustible building materials, the lack of a handrail? I mean it’s possible, but is it likely? When populations live in a nanny state they tend to escape to places that are more relaxed about such things in order to have fun…and spend money. My commentary, because it’s my blog and I always have to have the last word…. PLAZAS: The Balançoires were just opening up last time I was in Monteal and I have to admit that they are very cool. However we have to be careful with public plazas because there is a risk that they can become dead space if you don’t have the population density to keep them occupied and safe. STREET CLOSURES: This sounds like something Glen Murray would have done if he stayed on as mayor for 12 more years and got completely out of control. I think this is crazy, but could work on a smaller scale. There has been talk of closing off Albert Street in the exchange, or perhaps a couple other lanes. I could get behind that for sure. BIKE RENTALS: The negative me thinks that half the bikes would end up in the Red River, but yes .. bike rentals are a great idea if you have the “hard” infrastructure to go along with it. Many cities have them and it is a proven concept, although not necessarily a money-maker. ATTRACTIVE WASTE RECEPTACLES: This reminds me of a parking meter comparison I made on a different blog 3 years ago. 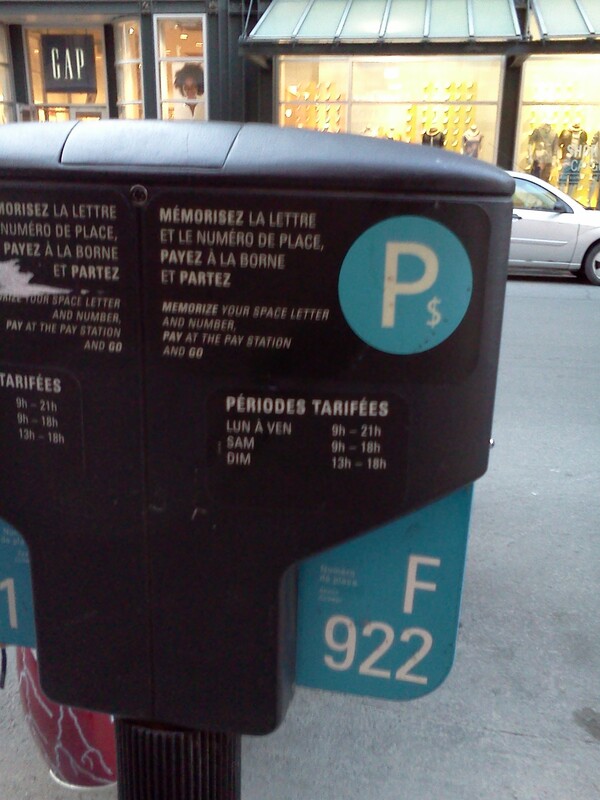 The meters in Montreal are so incredibly simple and functional. Montreal does everything so much better it seems. I am OK with the waste/recycling receptacles in Winnipeg, but give me their parking meters!!!! I thought I took a picture of something kind of like this in Winnipeg, but I can’t find it so maybe I’m imagining it all. I do like that though, especially on a quieter street, and definitely doable here in Winnipeg if we’re not already doing it. You think street closures are crazy ? Ah,,, you are a pegger – that explains it. The closure of Portage Avenue in particular. Let’s start small and see how it goes.